Having the courage to fight for policies that best support this system was a trademark of the Schwarzenegger administration and will continue at the Schwarzenegger Institute. Redistricting, open primaries, campaign finance, the role of media and the role of special interest all impact our political system and must be part of this important discussion. On Tuesday, March 26 the Supreme Court of the United States heard oral arguments in two cases, Rucho v. Common Cause and Lamone v. Benishek. Charles T. Munger, Jr assesses the changes wrought by the advent in 2012 of the top-two primary in three papers. Governor Arnold Schwarzenegger and the USC Schwarzenegger Institute for State and Global Policy convened the Terminate Gerrymandering Summit on Jan. 10 at USC. “I said I’d only do it if she became the global director,” said Schwarzenegger on Oct. 24 at the inaugural Bonnie Reiss Memorial Lecture, honoring Reiss, who passed away in April. USC Schwarzenegger Institute Academic Director and Associate Professor of Political Science and Public Policy, Christian Grose, wrote a rapid assessment of the redistricting reform initiatives. 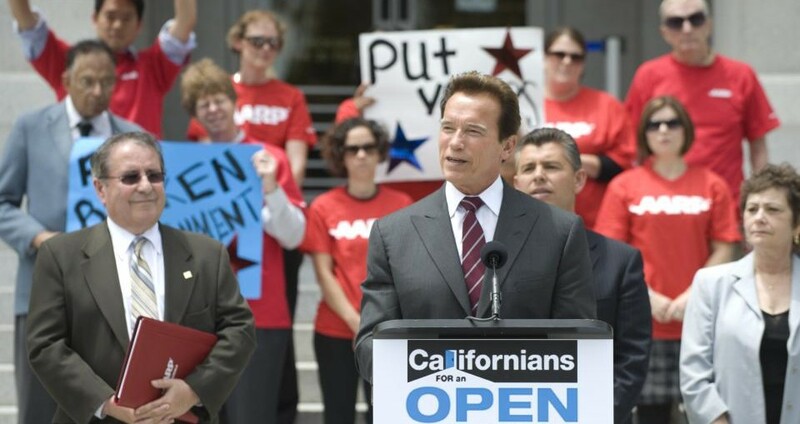 Governor Schwarzenegger took a break from filming Terminator 6 to support comprehensive redistricting reform and advocate for citizens redistricting commissions. Schwarzenegger and Ohio Governor John Kasich joined legislative leaders to celebrate the passage of a bipartisan proposal to change how Ohio draws congressional district lines. Gov. Schwarzenegger continued his crusade to end gerrymandering by filing an Amicus Brief with the the Supreme Court challenging partisan redistricting in the State of Maryland. Schwarzenegger Institute delegation, led by USC Professor Christian Grose, traveled to Arizona State University to participate in the Open Primaries National Forum and Research Roundtable. Speaking on the steps of the Supreme Court Governor Arnold Schwarzenegger continued his campaign to end the partisan drawing of legislative and congressional districts. The Schwarzenegger Institute teamed up and released a new briefing on the independent voter phenomenon and the impact that it is having on the American political landscape. Earlier this week, Gov.Schwarzenegger joined a number of prominent Republicans in filing amicus briefs, explaining to the Court why they support common-sense redistricting reform. The Institute is working with a coalition of good government groups on ending partisan gerrymandering through both ballot initiatives and the legal process. The USC Schools of Public Policy and Journalism partnered to screen the five-episode docuseries America Divided followed by a conversation with Norman Lear, policy makers, academics and producers. Institute Director Bonnie Reiss participated in the 12th and final year of the Clinton Global Initiative (CGI) Annual Meeting with leaders from around the world. UC Berkeley Event - California’s Top Two Primary: Will It Make a Difference? When asked what young people can do to fix their government in the face of crippling gridlock, Governor Arnold Schwarzenegger urged the crowd to look no further than the work of USC’s own students. The USC Schwarzenegger Institute hosted a conversation between Governor and USC Downey Professor Arnold Schwarzenegger and political commentator and host of MSNBC’s Hardball, Chris Matthews. On Wednesday November 6th the Schwarzenegger Institute, in partnership with the Jesse M. Unruh Institute of Politics, co-hosted the 10th Students Talk Back lunch panel discussion. Former President of Mexico Vicente Fox discusses immigration reform with Gabriela Teissier, Univision. Senators McCain & Bennet discussing the immigration reform bill with Ann Compton, ABC News.